There are several types of parameters that have to be considered while performing wheel alignment of a vehicle because incorrect camber, castor, toe, etc., are the main cause of wear & tear of tire and imbalance of vehicle. Performing the Alignment task with the help of Wheel Alignment Machine HWA-50 3D is fast and hassle-free. In 3D wheel alignment technology, there is no need to level the wheel head, i.e., targets because in such alignment targets do not contain battery and blue tooth dongle. Maintenance of target which is made of unbreakable material is very easy with Wheel Alignment Machine HWA-50 3D. Classical Structure Design : Brand new camera beam design makes the entire structure of the wheel alignment system rational and grand. Versatile structures are optional. Golden Eye : Superior lens can adapt to strict outside environment and filtrate the stray light with wider angle to capture and read the target discs appropriately. This will increase the accuracy of 3D wheel alignment. High-resolution Camera : With two imported high-resolution cameras and the fast and stable central computer system, transmission of the picture can reach 15 frames per second to make the measuring result be displayed continually. Target Disk : Target disks used in 3D wheel alignment are made of special materials which will not be broken even after falling from 10 meters height. The reflection materials with superior engineering film can last longer working life. Intelligent LED Guide : With special design, flashing LED lamps offer dynamic feedback during measuring and monitor the measurement processes effectively. 3D-tech Compensation : Only one moving forward and backward can finish comprehensive compensation for errors caused by deformed rims or installation. Four Wheels Reference Display : Toe, camber and their differences can be displayed on the screen simultaneously. Thus, enhance the visual display of 3D wheel alignment system. Front/Rear Wheel Reference Display : The front and rear wheel reference can be displayed simultaneously. Front/Rear Wheel Reference Display : The front and rear wheel reference can be displayed simultaneous adapting to different operators requirements. 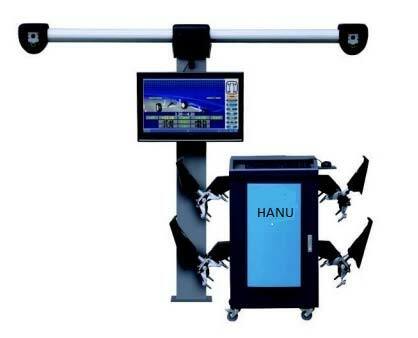 Body Dimension : Unique 3D wheel alignment body measurement system can measure chassis parameters, such as wheelbase, track width and axle offset. Caster/S.A.I. Measurement : Simultaneously measurement of caster, S.A.I. and inclusive angle can diagnose the accelerator off-tracking, the weight of steering wheel boosting and other factors. Four Wheels Toe/Camber Display : The data of toe and camber for four wheels can be displayed simultaneously on the screen to provide effective reference. Drive-on Camera : Special mirror function of the PC camera can guide the best parking position on the platform effectively.